Nkob is a village in Zagora Region, Morocco. 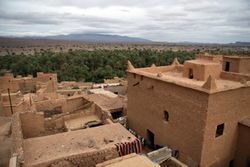 Nkob (Nkoub) is the capital village of the Berber Ait Atta tribe. The Ait Atta belongs to Confederation Ait Atta that are spread along Ouarzazate, Errachidia, and Azil Provinces. The Amazigh Ait Atta are an ancient Berber tribe existent before Arab and Islam entrance in Morocco in the 7th century. The Ait Atta tribe were the most important Moroccan tribes between the 15th and the 19th century. 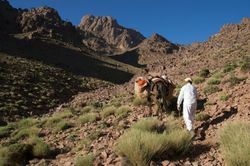 If you're looking to go deep into the Berber life of south Morocco, Nkob can be quite interesting and offers great experiences. Way out of Nkob, direction Tazzarine in south Morocco. 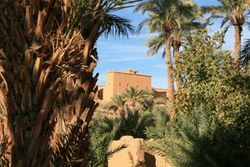 Nkob village is located on the road between Ouarzazate and Tazzarine. 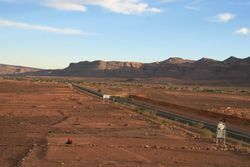 This is the southern road to connect Marrakech and Erg Chebbi Dunes in Merzouga. 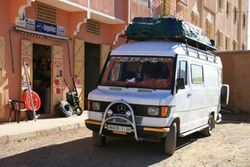 You can get a shared taxi from Ouarzazate to Nkob from the Central Bus Station (Gare Routiere d'Ouarzazate). 60 Dirhams per person. 8am. CTM brings you directly to N'KOb (via Quarzazate and Agdz). The line Marrakech-Tazzarine starts every morning in Marrakech at CTM-station at 10.30am. 120DH p.P. You arrive at N'Kob at about 7.00pm. You can get a bus from Ouarzazate's Bus Station to Tansikht 40 Dirhams (4 Euros) and from here get a shared to Nkob 12 Dirhams per person 15 minutes ride. Don't miss the change to visit Nkob weekly market. Patio inside Hotel Kasbah Ennakhile in Nkob, Morocco. 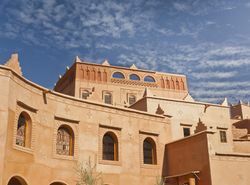 Kasbah Hotel Ait Omar, Centre Nkob 47702 Nkob BP95 Province de Zagora (N 30° 52‘ 26,6“ / W 5° 51‘ 45,3“ The carefully restored Kasbah sits on a slope on the outskirts of the old village centre of N’Kob Oasis), ☎ 00212 (0) 524 839 981 ([email protected]), . 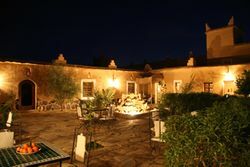 Offering traditional and modern prepared dishes -also vegetarian- according to south-eastern Moroccan traditions. Families travelling with children are very welcome. View on Kasbah Hotel Ait Omar from the courtyard down.